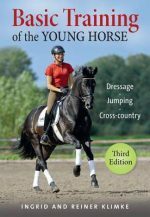 This classical text, which knowledgeable horsemen have been anxiously awaiting for years, is finally available in English. Henriquet’s personal record of correspondence provides a unique window into the private problem-solving dialogue between master and student. Now a master écuyer in his own right, Henriquet embellishes this new edition with 50 photographs from his personal collection. This first and only English edition includes many more photographs of Nuno Oliveira and his teacher than earlier editions. It has also been embellished with a glossary and a descriptive table of contents for the 71 chapters. “I inserted between the letters, most of the notes I’ve ever taken over the years. They are, sometimes the ‘screenplay’ of what I just saw in the ring. In some cases I have carefully noted the tips and reflections that reveal valuable concepts. Finally, I note the criticisms and comments that the Master sent me regarding a working session. This body of didactic elements reminds all those who have had the opportunity to work with him most of his philosophy, in its most direct form. And for those who alas, have not experienced this instruction first hand, fortunately, it will add to the discovery that they can do by reading about his great work.” -Michel Henriquet. Michel Henriquet was born in 1924, and holds a degree in Law and Letters. In search of elusive traditional classic French equitation, he believed might be lost, Michel Henriquet first studied with the Baucherist, Rene Bacharach, a student of Captain Beudant. Henriquet was among the first admirers of Master Nuno Oliveira, becoming a friend and disciple over thirty years, until the latter’s death.